Disease Pressure – Growers that have had an issue with sooty blotch and/or fly speck in the last few years will want to consider an appropriate fungicide if one has not been applied in the last week. Coverage with a high rate of Captan 80 WDG (5-6lb/A) or an application of either Pristine, Flint or Sovran would help to reduce this pair of diseases. Apple scab control is less of a concern as we are out of the primary infection season. Length of fungicide intervals can now be increased to once every 2-3 weeks if scab lesions are not present on leaves or fruit. Apple growers who have scab lesions present in their orchards should be applying protectant fungicides on a shorter 10-14 day schedule through harvest. This is suggested even in orchards with minimal and light levels of scab. Insect Pressure – Apple maggot continues to be found on yellow sticky traps in most orchards on the peninsula. Codling moth catches have gone down over the last two weeks as we are now at the end of 2nd generation flight. However it is still a good idea to choose control applications that target both pests if flights continue. Good to excellent rated materials for both codling moth and apple maggot should continue to be applied as long as trap catches warrant. These include Imidan, Assail, Exirel, Delegate, Voliam Xpress and Voliam flexi. European red mite numbers have begun to increase with the warmer and dryer weather. Growers should continue scouting the undersides of leaves to determine if control applications are necessary. 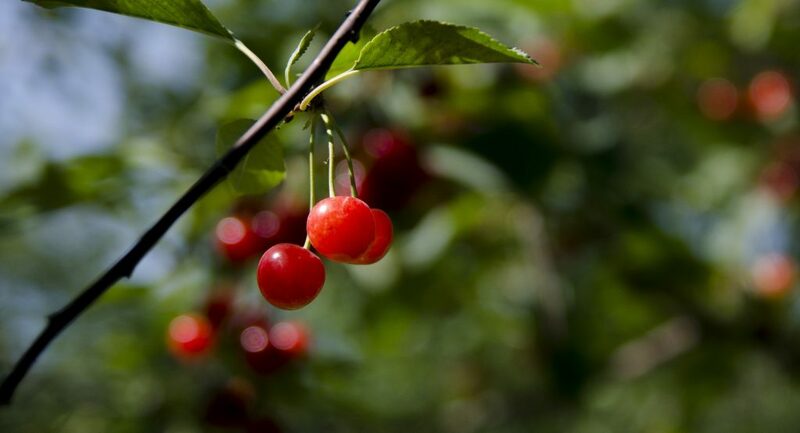 Disease Pressure – Cherry leaf spot infections continue to be found in orchards with some seeing more serious multiple lesion infections. As most orchards have now been harvested, it is time to make late season chlorothalonil (Bravo, Praiz, etc.) applications to keep leaves on the trees as long into the fall as possible. Copper fungicides may also be considered where infected leaves were high and a second post harvest application is needed. It would be best to use the copper compounds in a second application 3-4 weeks after chlorothalonil when temperatures are not as warm to avoid phytotoxicity. Insect Pressure – Populations of SWD in harvested orchards are increasing dramatically as control applications have been stopped. There is no advantage to controlling this pest once harvest has been completed.